There are as many face shapes out there as there are women, and isn’t that wonderful – after all diversity is beautiful, and we are all beautiful in our own way. The fact that different facial shapes suit different hairstyles is rather well-known – but what tends to be forgotten is that choosing and selecting flattering jewellery for your face can also dramatically enhance and balance your features. 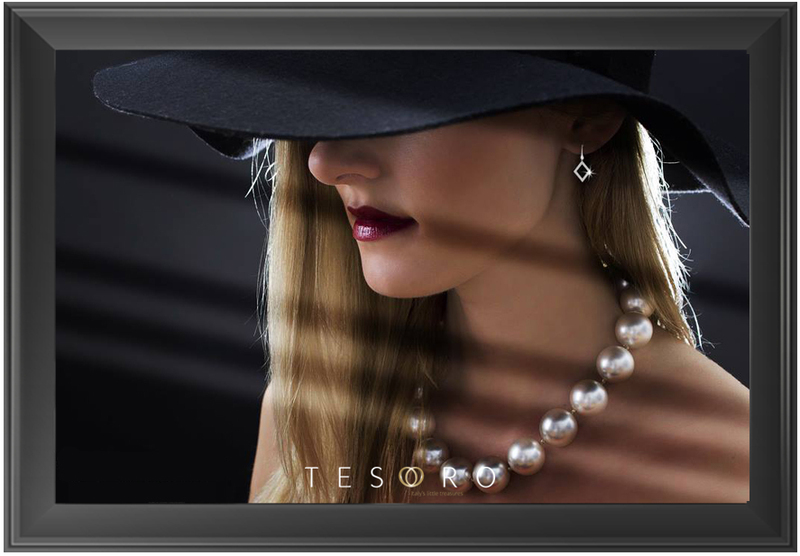 Since one of our core values here at Tesoro is making a woman feel and look beautiful, we have put together a handy Tesoro-Guide for you on which type of Tesoro jewellery to choose depending on your face shape. We hope this give you new ideas and inspiration for your jewellery collection! Oval faces are slightly longer than they are wide, have a soft cured shape and hold the same distance from the hairline to the eyebrows as from the eyebrow to the chin. Those who have this face shape are quite lucky – they are said to be the most sought after facial shape and are suited to wear almost any jewellery style. However, since they are fairly long, we suggest you focus on shorter necklaces, stud earrings or medium-length earrings which will create a beautiful illusion of added width around the jawline. Our stunning pear shaped, yellow coated sterling silver dangle earrings Alba are a lovely addition for those with an oval face profile. At 25mm, the earring’s short length, soft curves and accentuated width will naturally balance and enhance the shape of your oval face. The round face is just like the oval face; both soft and curved, however there is more of an equal distance all around the face which tends to be widest at the cheekbones. In order to enhance and add an illusion of length to a round face, you may choose longer jewellery such as extended, looping necklaces or long and dramatic earrings. Necklaces that create a “V” or “Y” shape are very complimentary to a round face! 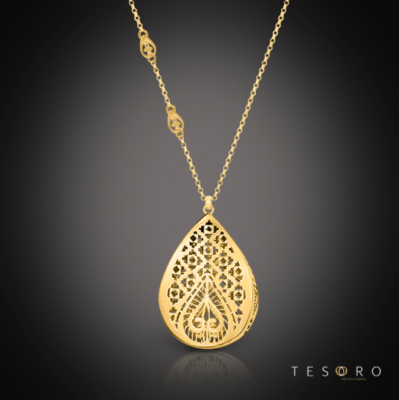 For those of you with a rounder facial shape, our necklace and pendant piece Trobaso will look simply stunning. 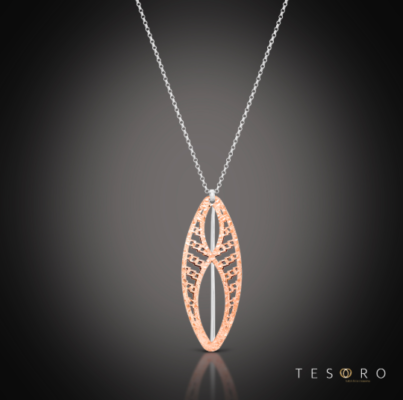 This rose and white gold pendant embraces Tesoro’s modern contemporary ideals, and its longer shape will elongate your facial shape and draw attention towards your collar bones. Both modern and versatile, Trabaso won’t ever go out of style. The delightful rose and white gold finish will add a feminine touch to your outfit and works wonderfully with wearing crisp white, gray or classic black. For a rounder face, deeper collars work beautifully to balance the shape. Think sweetheart, V neck, or Queen Anne-style tops. Long face shapes are a little longer than they are wide. They are quite similar to an oval face, just slightly longer. Choosing jewellery that is round, wide and not too long will compliment you by adding structure and balance. Choose short, round necklaces, statement studs or short drop earrings to give the illusion of a wider face. Designed for the sophisticated woman, Uta’s round profile will compliment those with a longer face just perfectly. A combination of an artisan-designed swirl pattern and hand-finished glitter fabric, this necklace is both feminine, sensual and complex. Combine the Uta necklace with a power-outfit, perhaps that aims to somewhat widen your longer facial shape; such as choosing necklines that end close to your neck; like a pretty boat or cowl neck. With its narrower forehead and wider jawline, pear shaped faces have the opposite proportions to heart-shaped faces. Remember, opposite attracts! Heart-shaped earrings are beautiful for pear faces, or beautiful delicate studs. You may choose to wear jewellery which softens the jawline and ads width to the cheekbones. A short necklace with a V-shaped pendant works heavenly, giving the appearance of a longer face, drawing out the jaw. 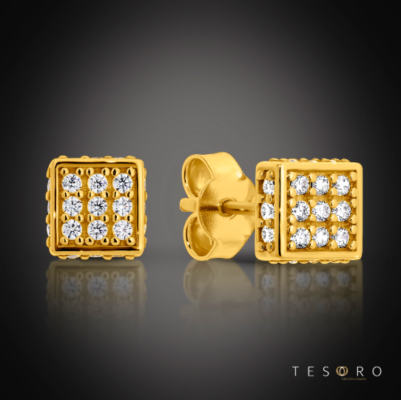 Our exquisite Borno yellow gold stud earrings will bring some discreet but luxurious sparkle to your every day look. These 9 carat yellow gold stud earrings are encrusted in lux cubic zirconia stones and will take you effortlessly from day to night. Borno is incredibly versatile and works with every outfit. They are just as gorgeous for work, or that romantic dinner date. Pair your Borno’s with an outfit which slims your jawline and chin area; such as V-necks, scoop necks, sweethearts or collared shirts open at the neck. Embellished necklines will work wonderfully too! Straight lines and a nice strong jawline – these are the characteristics of a square-shaped face. Forehead, cheeks and jawline are all usually roughly as wide as each other and is around the same width and height. Those with a square facial shape may want to add round, soft angels to create an illusion of length and soften that jawline just a touch. 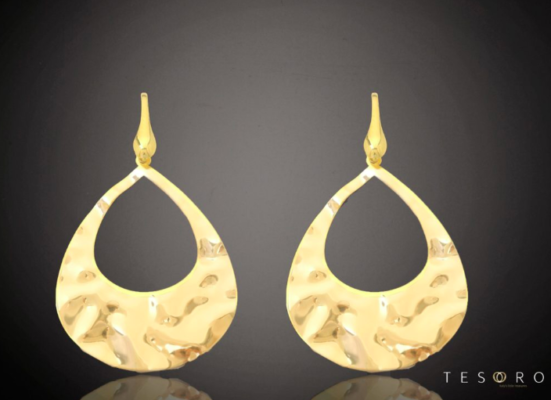 Think long, curved round necklaces, oval hoops or narrow chandelier earrings, making the face look softer and longer. The perfect round shape of Ussana is a stunning statement piece and is a wonderful piece of jewellery for a square-shaped face. With its detailed bohemian-inspired decorative patterns and glitter fabric placed in the centre, it certainly is a show-stopper! Pair the Ussana necklace with your favourite dress or top – a scoop neck or sweetheart neckline creates a lovely softer touch for a square-shaped face. If you have a neat, narrow chin and your face widens towards the hairline, you probably have a heart-shaped face. The width of the face at the forehead is generally a little larger than that at the chin. Here we want to balance the narrow chin by adding width at the jawline with wide earrings, as well as at the base of the neck with shorter and curved necklaces. Teardrop or triangle shaped earrings also look lovely on a heart-shaped face! 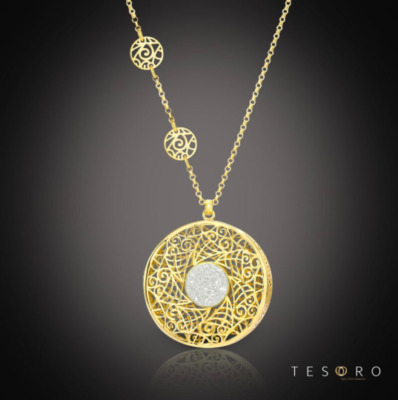 Our Yellow Coated Palermo pendant and necklace is set on a diamond cut belcher link necklace. With its glamorous modern European design it’s going to delight every time it’s worn! This soft, round pear-shaped pendant will look stunning on a heart-shaped face, and will elongate and balance the face. Wear your Palermo with rounded necklines which softens your sharp jawline. High or wide collars, boatnecks or off-the-shoulder necklines also go great with heart-faced facial shapes. Whichever face shape you have, there are many Tesoro-options to choose from to make sure you look and feel confident, glamorous and your very best You. Remember – it’s not about strict laws or rules, but about you feeling comfortable and happy with your style and look. 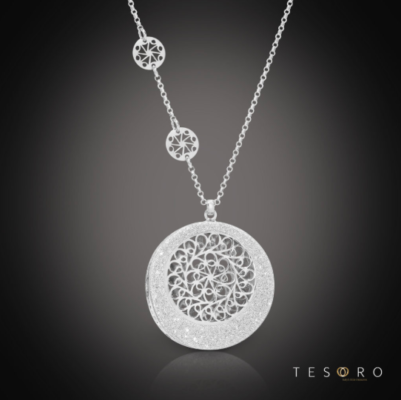 Play around with different jewellery-styles and types, perhaps keeping above tips in mind – and decide which Tesoro works for you.